Making The News Canada: Doing good is hard work. So is paying for it. 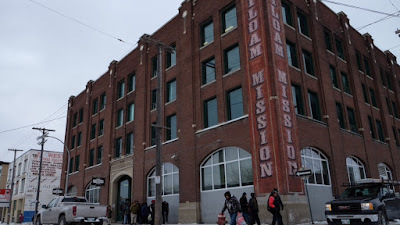 Siloam Mission, a Winnipeg charity that serves homeless people, has come in for criticism recently by a Winnipeg Free Press columnist who says it is spending too much to raise funds. He followed with another column charging they send out too many appeal letters. Tired of seeing this important non-profit take it on the chin, I decided to respond with an op-ed in the Free Press about the realities facing charities today when it comes to fundraising. Siloam Mission—and other charities—have come in for some criticism lately over fundraising practices. In particular, questions have been raised about the number of direct mail letters being sent by various groups, and about the amount of money spent to raise funds. While no organization wants to spend money it does not need to spend, what’s true for business is also true for charities—you have to spend money to make money. That has been true for decades. What’s different today is that charities need to spend more than they used to in order to keep providing their services. When I started in the non-profit sector in the 1980s, things were different, and simpler. Back then, it was much easier to reach potential donors. If you could get news about your appeal into newspapers, radio and TV, you pretty much covered almost everyone you wanted to reach. Things are very different today. Newspaper circulation is declining, as are the number of people tuning into radio or TV news. Today, we live in a noisy and fractured world of communications. Not only are people bombarded with messages from many different sources, they also have many more options for getting information—primarily through social media. Breaking through this clutter is difficult, and expensive. It requires focus and repetition. And even then you may only be reaching a fraction of the audience, compared to ten or 20 years ago. Then there’s the matter of donor loyalty. In the not-to-distant past, charities could count on donors selecting a charity for life, then making regular donations. Today, for many people donor loyalty is mostly a thing of the past—especially for younger people. Often, the only way to get a donation is to send one, two or more direct mail letters, in the hopes of getting a cheque in return. Speaking of cheques, if you are under the age of 30, you probably don’t write many of those. Most transactions today are now by credit or debit cards, and much of that is online. One of the fastest-growing expenses for charities is the service charges from credit card companies and businesses that provide encryption services. And what about all those direct mail letters? Studies show that direct mail continues to be one of the best ways to raise funds. It is certainly better than e-mail or social media, which has not yet shown itself to be a good way to appeal to donors. Finally, about those charity rankings; is that the best way to rate a charity? Many in the non-profit sector are uncomfortable with them. This includes people like Bruce MacDonald, President and CEO of Imagine Canada, an umbrella group for Canadian charities. What MacDonald objects to is how the highest rankings are given to groups that spend the least on things like staff salaries, administration, communications and fundraising. The ones that need to spend more to deliver their programs end up with lower scores. What MacDonald would rather see measured is impact—what effect the charity has on the lives of people it is trying to help. If it costs more to help someone beat an addiction, escape homelessness or overcome poverty, that should be seen as money well spent. “If you want real impact, you need to have real investment,” he stated. The non-profit sector today is experiencing dramatic challenges. Needs in Canada and around the world are rising. At the same time, the pool of the most faithful and generous givers—older people—is literally dying. Coupled with a decline in attendance at worship services (religious people are another major source of funds for charities), non-profits are struggling to raise the funds they need for their important services. Doing good is hard work. So is paying for it. And it’s getting tougher every day. From the April 21, 2017 Winnipeg Free Press. Excellent column, John, thanks for bringing light to important issues so clearly. I hope this article gets wide readership, and that other charities can utilize it to explain the current situation to their constituencies too. Great article, John, on a topic that sadly is forcing many charities to critically consider their longevity.